- D 96089 : "The Vigilante of Pizen Bluff", from 1996, by Don Rosa. Eng and Chang were born in Siam on May 11, 1811 to a Chinese father and half-Chinese, half-Malay mother. 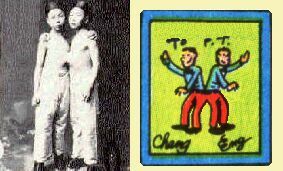 The boys were known as "The Chinese Twins". Despite the fact that their birth was initially believed to be an omen of the end of the world, they brought celebrity to their small village. Their mother refused to allow doctors to attempt to separate the boys, fearing that to do so would result in the death of one or both. Instead she taught them to stretch the tissue that joined them so that they could stand side-by-side rather than always face-to-face. In 1828, 17 year-olds Chang and Eng left for Boston, excited to see the world, with the help of a Scottish merchant : Robert Hunter. After a successful and profitable tour of the States, the group then sailed to England where they became quite popular and were often examined by doctors and visited by royalty. France did not receive them quite so well : they were denied entry by the French government. But the rest of Europe wasn't closed to them, so they toured extensively, continuing to pack venues. In 1832 Chang and Eng broke off their arrangement with Captain Coffin (Mr. Hunter having sold his share of the rights to Coffin while they were in Europe) when they realized that he was taking the vast majority of the money received for their tours. This break led them to P. T. Barnum, with whom they toured. In 1839, they decided to quit the exhibition life and settled down in Wilkesboro, North Carolina where they became farmers. 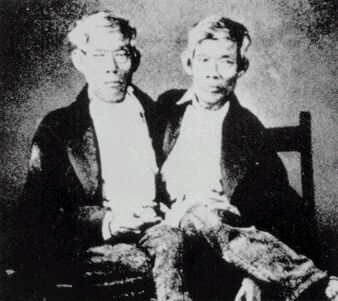 In 1839 they became United States citizens, but lacking last names they were simply listed as "Chang and Eng, Siamese Twins", so in 1844 they decided to adopt the name Bunker. In April, 1843, Chang was married to Adelaide Yates and Eng to Sarah Ann Yates, two of nine daughters of local farmer and part-time clergyman, David Yates in a double wedding. Eng had six boys and five girls; Chang seven girls and three boys. All were normal except for a son and daughter of Chang's who were deaf mutes. In January, 1874, Chang Bunker died after a severe case of bronchitis, possibly from a cerebral clot. Eng died shortly thereafter. In "The Vigilante of Pizen Bluff", we see an inscribed photograph of them in a frame at Phineas T. Barnum's office.